Please refer to our stock # FIG80 when inquiring. 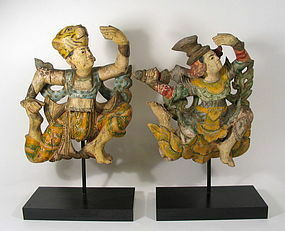 DESCRIPTION: A pair of polychrome figures engaged in joyful dance, one male and one female, mounted on display stands. These colorful hand carved figures, called "Nats" or nature spirits, are dressed in traditional Thai costumes with the male figure wearing a tiger head cap. Prior to the advent of Buddhism, the Thai people were animists who worshipped a series of nature spirits called Nats. Later these were incorporated into Buddhism and often Nat statues will be found in Buddhist temples. On the back can be seen the original iron screw-eye attachments which would have been used for hanging the figures. CONDITION: These antique figures, over 100 yrs. old, retain much of their original color; some age related wood splits, all stable. DIMENSIONS: Each approximately 23" high (58.5 cm) x 13" wide (33 cm).